Tiziana Manoretti is an only child in her late twenties blessed with loving parents, a promising career, and a best friend who fiercely protects her. When her mother falls seriously ill and the relationship between her parents becomes suddenly strained, a carefully hidden family secret is revealed and Tiziana’s seemingly idealistic world is turned upside down. After discovering she was born in a Naples orphanage and subsequently given up for adoption, Tiziana sets out for the small town of Gaeta in an attempt to find her birth parents. Meanwhile, her best friend Christopher is sending her mixed messages, causing her to wonder if there is more to their relationship than just companionship. As she becomes intertwined with a handful of interesting characters who help her uncover her past, Tiziana needs to decide whether her feelings for Christopher are deeper than she realizes. She discovers herself and others all while her family’s resilience and love for one another is tested when confronted with a shocking truth. The answers lie in a box found in a closet in Italy, and Tiziana must determine if she wants to embrace the heartache and the pain from her past in order to learn forgiveness and find peace in the future. I love books about family relationships and this book is full of so many different aspects of family life. It centers around Tiziana who, when her mother has health issues, discovers that she was adopted. 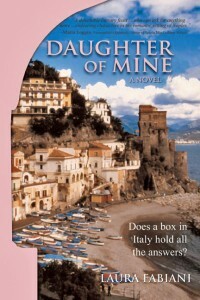 This sets her on a journey to Italy where she searches for answers about her birth parents. You wouldn’t know that this is Laura’s first book. It is a fabulous story and she makes you feel as if you are in the midst of what’s going on, and you can visual being in Italy. The characters are well written and you get a sense of familiarity with them. I can’t believe it took me so long to read this book, but I’m glad I finally did. I really hope the author writes another book soon. I will definitely be reading it. This is a quick read that you won’t want to put down. It will tug at your emotions until the last page, and longer. It sounds like there could be some heartbreak in those pages but a good story overall. It certainly would be shocking to discover you were adopted rather than being told and being able to ask questions. I always wondered about an adopted child seeking the birth parents when the people who chose to adopt, rear, sit through illness and encourage with goals were the ones there for them. Once Steve Jobs wrote his adoptive parents WERE his parents, because they were there for him. Could be interesting and glad to hear the s is a good author. I’m glad you enjoyed this so much – Laura is a gem! Vicki, I enjoyed your terrific review of Laura’s book. It sounds really engaging and emotional. This sounds like my kind of book! I love family relationships and secrets and it sounds like the setting is really wonderfully done. I’m adding this to my TBR!